From Left: Lex Marvin, Troy Herrel, Ben Kessler, Dr. Mary Kay Pohlschneider, Alex Parsio, Faye Dean. August 16, 2018/National FFA Organization – A local FFA chapter was recently selected to compete for national recognition in a career development event at the 91st National FFA Convention & Expo in Indianapolis, Oct. 24-27. 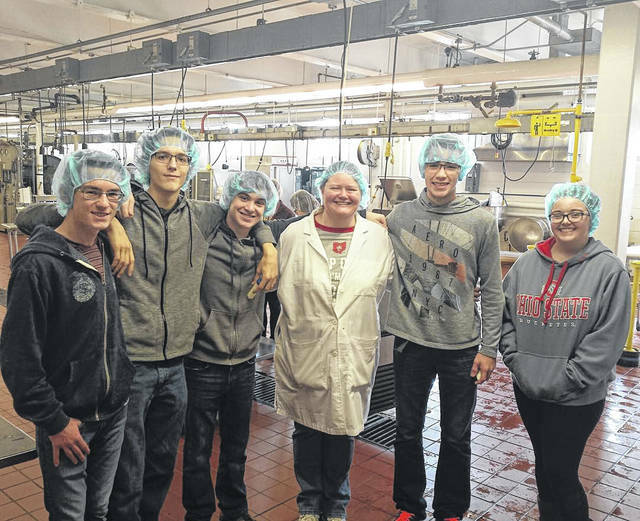 The Big Walnut – DACC FFA Chapter from Sunbury, Ohio will send members to Indianapolis as they vie for national honors in the area of Food Science & Technology. Kerry Taste and Nutrition and U.S. Poultry & Egg Association sponsor the event. FFA members who will represent the chapter include Faye Dean, Ben Kessler, Lex Marvin, and Alex Parsio. Jeffrey Stimmell is the chapter advisor and the team is coached by Dr. Mary Kay Pohlschneider. In preparation for this event, students have been working throughout the summer with industry professionals to learn skills needed by professionals in this in-demand field. Team members have been preparing for the event by studying reference materials and reviewing FDA and USDA standards for food processing. The team also completed a training exercise at The Ohio State University with faculty in the Department of Food Science & Technology in July. Food science and technology is one of 25 career/leadership development event areas, covering jobs skills in everything from communications to mechanics. Participants take an objective test, design and formulate or reformulate a simulated food product, practice quality assurance principles, conduct a sensory analysis and apply food safety and sanitation principles. CDEs and LDEs help students develop the abilities to think critically, communicate clearly and perform effectively in a competitive job market. https://www.sunburynews.com/wp-content/uploads/sites/48/2018/08/web1_Food-Sci.jpgFrom Left: Lex Marvin, Troy Herrel, Ben Kessler, Dr. Mary Kay Pohlschneider, Alex Parsio, Faye Dean. Information for this story was provided by Jeffrey Stimmell, DACC Satellite Instructor for Agricultural Sciences, Big Walnut Local Schools.